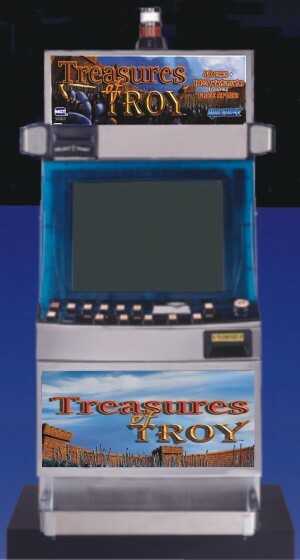 The ancient City of Troy and all of its treasures is the theme of the video slot game from IGT call Treasures of Troy. This video slot game has 5 video reels and 4 rows of symbols that can be shown on the video screen. This game has 40 paylines but when the slot player places their bet, the slot player will actually bet 80 credits to activate the Multiway Bonus. The maximum bet of 50 credits per line the slot player can bet up to 4000 credits for a maximum payout of 250,000 credits when 5 Treasure of Troy symbols land on a paid payline. Some of the other symbols that are the Trojan Horse, Helmet with crest, man wearing helmet, woman’s face, man’s face, sword, and face cards for Jack to Ace. This game has 2 bonuses the Mulitway Bonus and the Free Spin Bonus. The Multiway Bonus is activated when the slot player bets twice the amount that there are of the number of maximum paylines. So when there are 40 paylines, the slot player will bet 80 credits so as to activate the Multiway Bonus even though there is only 1 credit per payline. The award of matching symbols to the slot player is that of the paytable as 1 credit per payline. The Multiway Combo occurs when a symbol lands in a played position on consecutive columns, beginning with the far left column. The pay amount for the combo is multiplied by the number of combinations that occur in the played positions and the bet per line. The Free Spins Bonus is initiated when 2, 3, or 4 Trojan Horse symbols are shown anywhere on the center column of reels. The free spins are awarded to the slot player automatically at the same bet structure as the initiating game. Line wins are awarded from the line bonus paytable. If the multiway side bet was played in the initiating game, then multiway wins are also awarded from the multiway bonus paytable.. Free spins can be re-initiated from within free spins with 2, 3 or 4 Trojan Horse symbols anywhere on the center column of reels. Upon re-initiation, the additional number of free spins is equal to the originally awarded amount. The maximum number of free spins awarded to the slot player is 130 spins. When all awarded free spins have been completed, the bonus ends. When 2 Trojan Horse symbols are shown, the slot player is awarded 10 free spins, so when 3 Trojan Horse symbols shown, the slot player is awarded 15 free spins and 4 Trojan Horse symbols 20 free spins.